Apple next week is likely to announce that all Mac owners who run the latest version of the OS X operating system, Lion, will also receive at least some of the services from iCloud for free, sources have told AppleInsider. But one important component of iCloud is unlikely to be be free: music streaming. While those people familiar with Apple's plans offered no indication regarding the music streaming service, the licensing agreements that Apple has worked to secure carry a price tag that is expected to be passed on to users in some form. It is, however, possible that Apple could offer some sort of an introductory or trial period for its music streaming service. It was CNet that reported in April that Apple's iCloud could be free at first, but that the company eventually plans to charge customers for hosting content on its servers. Free access to iCloud may not be the only carrot that Apple dangles in front of users to incentivize upgrades to Lion. A separate source that reached out to AppleInsider also indicated it's possible that the company could be planning a one-two punch, offering not only iCloud, but also a low sale price for Lion. This source, who has an unproven track record, claims that Apple higher-ups were pushing for an aggressive price point on Lion —an approach the company already employed with great success when Mac OS X 10.6 Snow Leopard launched in late 2009. Snow Leopard debuted with a $29 price tag, and that strategy resulted in sales that doubled the previous record-setting launch of Mac OS X 10.5 Leopard. It's possible that the lower price could also be tied to purchasing Lion through the Mac App Store. The company already does this by selling its professional photography software, Aperture, for $79.99 in the App Store —a price $120 lower than the $199.99 Apple charges for a boxed copy of Aperture 3, and even $20 less than the $99 Aperture 3 Upgrade. Whether Apple will choose to go with the same sub-$30 pricing of Snow Leopard when Lion goes on sale is unknown. But software now plays a very small part in Apple's bottom line, and the company is said to be interested in ensuring that users quickly upgrade to the latest version of Mac OS X, through incentives and low barriers to entry. Apple executives are said to have so much confidence in Lion, they believe the new operating system will help the company carve away even more market share from traditional Windows PCs. The idea is near-ubiquitous adoption of Lion on Macs will go a long way in promoting the Mac platform and further expand Apple's market penetration. Lion may also help PC switchers make the jump to the Mac with a new "mentor" tool. One person with knowledge of the company's plans said this service aims to help people set up their new system, including external devices like printers and routers. The source expressed uncertainty about the "mentor" tool, suggesting it may not make the final cut. Apple is also said to be planning an aggressive marketing push for Lion when it debuts later this year. 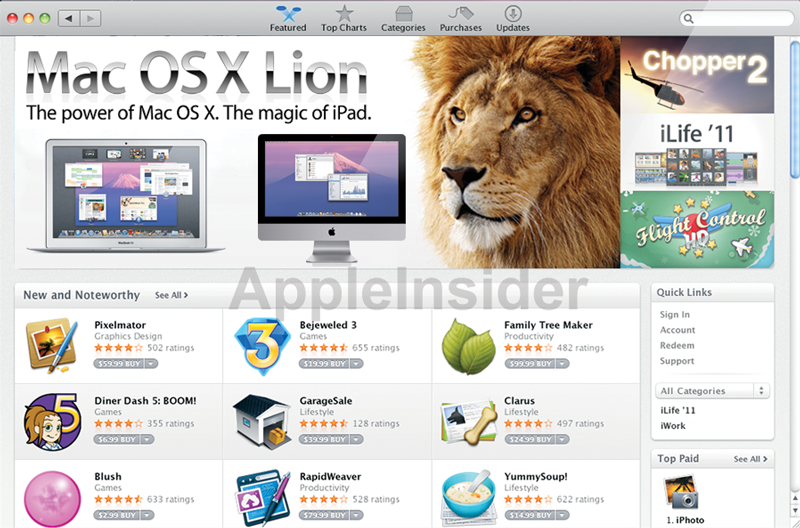 In the weeks before Lion goes on sale, the company is expected to showcase several applications available on the Mac App Store to spotlight some of the biggest features of Lion.